Are you ready to take your organization's event to the next level? Mad Science can help! We will engage your students in a science experience they will never forget. 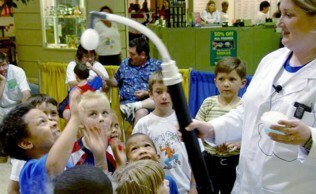 Mad Science will bring interactive science exhibits, hands-on experiments and fascinating displays right to your location. Mad Science Fun Stations are ineractive booths that are perfect for Science Days, Company events, Back to School Nights, etc. Kids will rotate through each of our science explorations and make/take projects. Fun Stations are typically 1 hour and accomadate 100 kids per booth; however, we will be flexible to your needs. Magnet Bridge Challenge – Test your bridge building skills as you attempt to build a bridge using only your creativity and magnetic force. Optical Illusions – Baffle your mind and your eyes with our fascinating optical illusions. Learn about reflection, mirages, lenses and how light travels. Ecstatic Electricity – Create direct currents, uncover hidden static charges and learn about the power of voltage in this ecstatic station. Dry Ice – Explore the states of matter and watch in amazement as we demonstrate the extraordinary and chilly properties of dry ice! Slippery Science – Discover the ooey gooey origins of plastic and see why it can be so hard to break. Make your own batch of colorful slippery slime! Mad Science Putty – Discover the stretchy, bouncy fun of polymers! Make your own batch of Mad Science Putty! *And more! Stations depend on supplies.